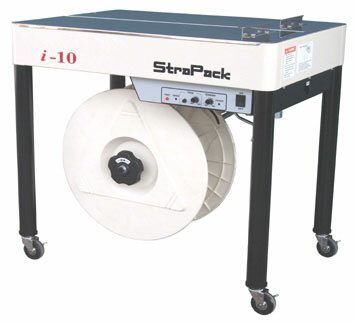 The innovative I-10 is Strapack's latest and most modern semi-automatic strapping machine. It is amazingly quiet; it is ideal for office use as well as use in any industrial and commercial facilities. Less moving parts and simple sealing head design assure ease of maintenance and lower cost of operation. 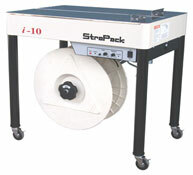 Low energy consumption than any other strapping machine. It is the new generation of the semi automatic strapping machines. Call or contact us today for a machine demo (Southern California Customers Only). Strap Widths Accepted - 5mm, 1/4", 3/8", 1/2" and 5/8"
Core Size Accepted - 8" x 8" or 9" x 8"